I'm trying to print a rather big part, nearly 13cm in diameter, 3 cm height, PLA. However, my UM2 fails to print even the very first layer. It starts pretty much okay, but it looks like with the matter of time the plastic line becomes thinner and thinner until UM2 stops extruding at all. The feeding engine at some time starts clicking and the feeding gear jumps back (probably, to avoid grinding plastic). Tried cleaning up the nozzle (by sequentual manual pushing of plastic at 220C then manual pulling at 90C), did not help. Smaller parts (size around standard Ultimaker Bot) are printed okay. Picture below, video of clicking feeder here. Any advise is highly appreciated! These are fine settings for the second layer and higher, but the bottom layer defaults to extra thick. And it should or you will have other trouble. You want .2mm or .3mm on the bottom layer - you should be able to get away with .2 but if your levelling is a little off, then .3mm is more forgiving. What is the "bottom layer speed" on advanced tab? And under quality what is the initial layer thickness? You are going to probably need to raise the temp to 240C for the first layer. There appears to be no "islands" (gaps between sections of the print) so you don't appear to need about stringing so if it were me I would print the whole thing at 240C but if you want nice quality lower the temp back to 220c or 230C after that first thick layer is done. .06 is damn thin. It's going to take a lot longer at that thickness. Printing .2mm layers is a lot of plastic going through the nozzle so you need high pressures that the extruder just can't quite achieve. Raising the temp makes the plastic flow more like honey than toothpaste so you don't need so much pressure from the extruder. 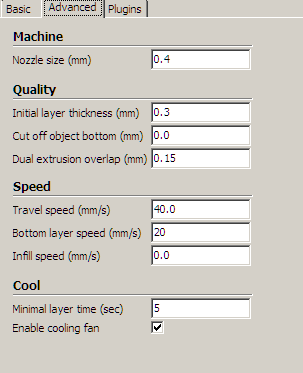 If it still skips, just go to the tune menu and lower the speed % from 100 down to 50 or lower until the extruder stops skipping. The print head doesn't move as fast because it has less space to accelerate and slows down at the end of each line allowing the pressure to reduce just enough to avoid slipping. 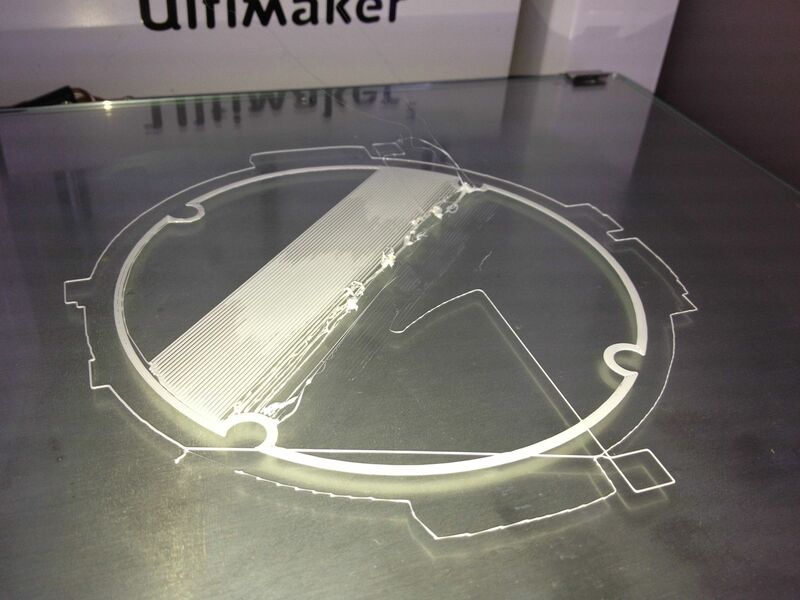 Is the layer height and speed and temperature of the UM Robot identical to this part? 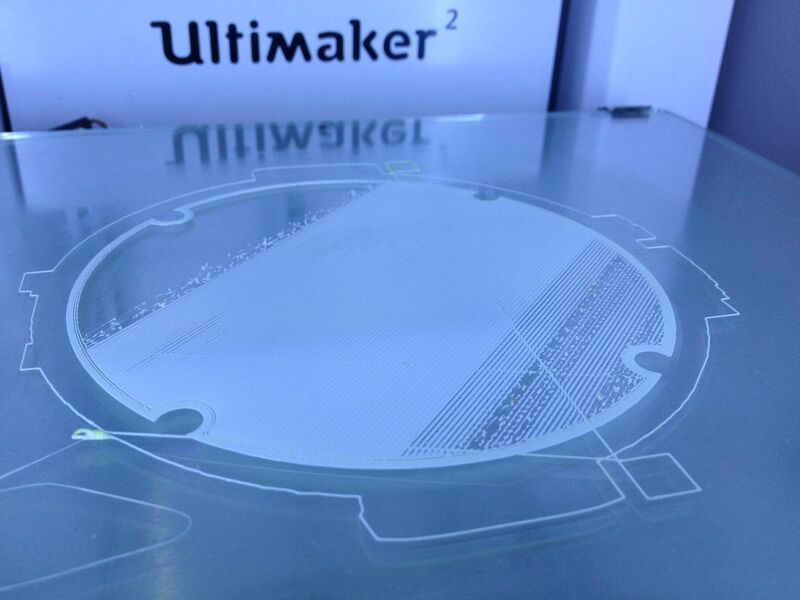 The bottom layer speed is 20mm/sec, inital layer thickness is 0.3mm. UM bot settings are identical. Just in case if I missed anything, here is the whole set of my settings for the big part. I'll try to print the part at 240C for the first layer and update if it worked. Big thanks for the advise and explanation of the first layer mechanics! After that i've made an initial layer thickness 0.2 mm instead of 0.3 and raised temp to 250C. This time UM2 managed to get much further than last time, however after some time it started underextruding heavily. I'm away from home so replies are slower than usual. Illuminarti also. Well it's probably feeder issues. The first thing to check is for filament tangles. And how the filament feeds - you want it as straight as possible as it feeds into the feeder. I sometimes put my filament roll on the floor in a wooden holder I built. Also, is the feeder (hopefully it is) on the topmost/loosest setting? The two white squares in the slots of the black feeder should be all the way to the top. 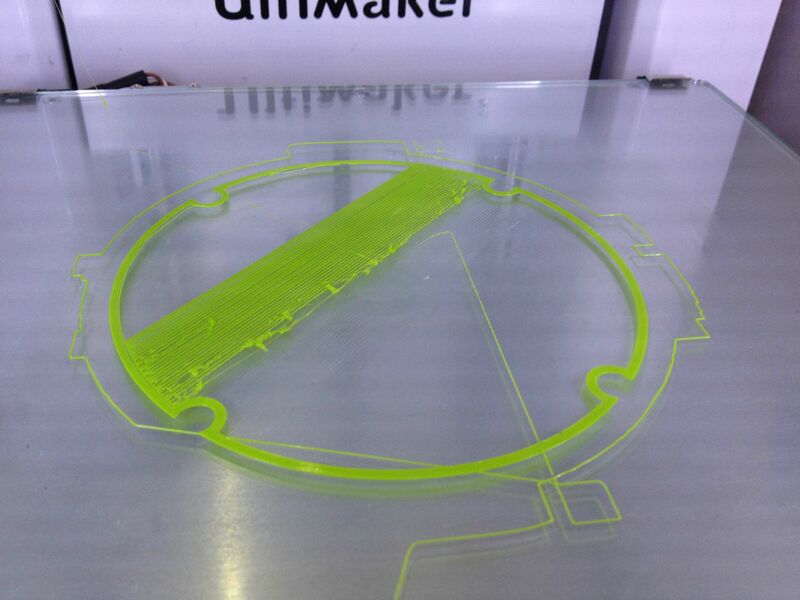 Watch the feeder on the back while you print - does it slip backwards just when the bad extrusion starts? It could also be that your print head is a tiny bit too close to the glass. Although I think this is unlikely as once the bad extrusion starts it never seems to recover. Please answer about the slipping backwards feeder. Also there could be temperature issues (too cold). Does the temperature of the nozzle bounce around? Go to the tune menu and watch the temp while it is printing. It shouldn't change more than 5C. 250C is dangerously hot - I don't like to go over 240C. If you leave PLA in there at 250C for a whole minute it can cook it into a brown goo that may never completely come out of the nozzle without burning it to ash in a gas flame. I agree with GR5, almost certainly a feed problem and 250 is way too high, most PLA filaments have an upper temp limit of 220 (although quite a few people on this forum seem to go considerably above that!). Are you printing on glass? If so I would recommend extra strength hairspray to improve adhesion. Also I think I noticed, but did not dwell on it so never tried to repeat or consider it, that your layer height, ie not layer 1, does affect how the 1st layer is laid down. It makes no sense to me but I experienced it a month or so back. I increased the layer height and the problem solved itself. You might want to change from .06 to .3 and just see what happens. Some time ago I've found a solution for the issue. I'm posting it here just in case if someone else encounters it. The main issue was the fact that filament rests on a roll and takes a round shape. As a results, the friction in a bowden tube becomes pretty high and the engine pushing filament forward starts to skip back. So all you need to do to fix the issue is to remove the filament roll from holder, put it somewhere aside to give more space between roll and feeder and straighten the filament with hands. 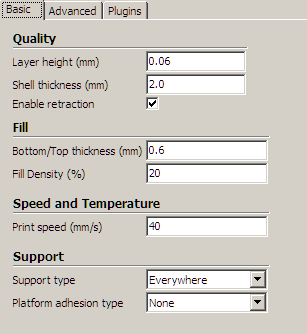 It is not very convenient procedure, though in my case it helped ideally - my UM2 stopped skip layers and now allows to print rather big prints. 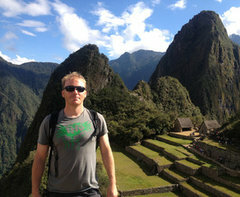 Thanks for posting your results Sjel, glad that you have had some success. Sometimes its the simple things that help. Very early on in my printing stage I had some big issues with underextrusion and feeder skipping and I started to eliminate things one by one. Changing to Faberdashery filament which was uncoiled did help me too and I have never gone back to rolled filaments since ( Apart from colorfab ).